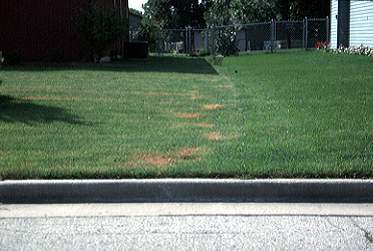 Burned grass is a drawback of fast release nitrogen fertilizers. Fertilizing is an important lawn care practice, as it influences grass color, ability to recover from stress, and helps prevent weed invasions and disease. There are important features to consider when choosing lawn fertilizers at the local garden center. Nitrogen (N), phosphorus (P), and potassium (K) are the three major nutrients needed by lawns. Nitrogen is the nutrient required most, although too much nitrogen can cause excessive topgrowth, leading to assorted problems. Percent nitrogen (by weight) is always the first of three numbers on the fertilizer bag, followed by phosphorus and potassium. For example, a 18-6-12 fertilizer contains 18 percent nitrogen. This number is important because it determines how much fertilizer is needed. In most cases, a rate of one pound of nitrogen per 1,000 square feet is suggested for each fertilizer application to the lawn. If high percentage nitrogen fertilizers are used, then less actual fertilizer product is needed to supply that one pound compared to fertilizers with low percent nitrogen. Recommended ratios of N-P-K for lawn fertilizers include 3:1:2 or 4:1:2. Another important factor in choosing nitrogen fertilizers is what kind of nitrogen is actually in the product. Nitrogen fertilizer may consist of fast-release or controlled-release nitrogen. Advantages and disadvantages are outlined in the table below. For lawns, fertilizers containing controlled-release nitrogen sources are suggested for most applications. Check the guaranteed analysis information on the fertilizer label for information on what forms of nitrogen are in the product. Water insoluble nitrogren in slow-release. In addition, a variety of special lawn fertilizers may be found. Winterizer fertilizers are typically high in potassium, and although advertised for fall application can be applied in spring as well. Potassium is used all year by grasses, and is involved in heat and cold tolerance, disease resistance, and other stress tolerances. Weed and feed products contain a broadleaf weed killer for weeds such as dandelions (fall application); others contain a preemergence herbicide to control crabgrass (spring application). Lawn starter products, typically high in phosphorus, are intended for newly seeded lawns and freshly laid sod. Sources of organic forms of Nitrogen by their very nature are in a non-burning form and are released to the turf plant over time to varying degrees bases on soil temperature and moisture levels. There are a variety of organic sources of nitrogen, phosphorus and potassium available to the homeowner. As mentioned earlier most organic fertilizers are derived from plant or animal sources. Plant sources would include alafalfa and cottonseed meal and seaweed. Examples of animal sources would include bone meal and the manures from chickens, cows and horses. Yet another source comes directly from mother nature in the form of rock phosphate for a source of phosphorus and green sand for a source of potassium. Find and use products that are locally available whenever possible to keep the input costs down.